This queen size Gel mattress provides excellent pressure reduction and comfort for patients who need it most. This queen sized gel mattress topper does an excellent job or dispersing pressure from a small painful pressure point to a wider surface area. Ideal for one or two people. Split gel bladders contain an aqueous non-toxic gel solution and prevents migration spreading the gel evenly through the mattress. Completely antimicrobial Nylex top cover and high-density foam surround a layer of super-conforming gel. Bottom cover is skid-resistant vinyl. Multiple gel packs at foot, middle torso and upper torso prevent gel from pooling if head of bed is raised. Fluid-proof cover is finished with inverted side seams to help prevent fluid penetration. Four elastic bands secure corners of overlay to the mattress. Convoluted foam topper prevents heat and helps to keep the patient cool and dry. 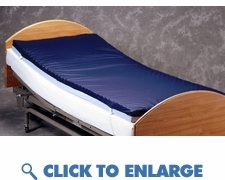 Designed to heal and prevent bedsores fits over top existing queen size mattress or larger medical bed frames.